Secretary of State, John Kerry. 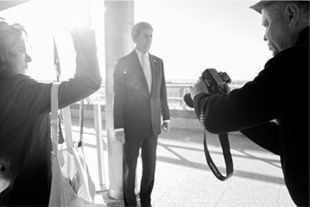 State Department, Washington D.C.
Mark is a portrait photographer based in Cambridge, Massachusetts. Known for capturing the “indecisive moment”. Mark shoots for magazines, agencies, and private commissions. When not shooting, Mark spends time at his two cafes - Cafe Zing in Porter Square and Kickstand Cafe in Arlington, MA. For more information, please call Mark’s studio manager, Marissa.